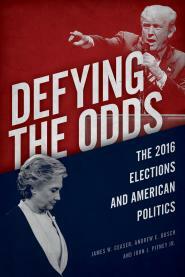 In Defying the Odds, we discuss congressional elections as well as presidential politics. The evidence just keeps piling up: Democrats are in a good position to take the House in the 2018 midterm elections. Two new data points arrived on Wednesday: Both Quinnipiac University and the Kaiser Family Foundation found Democrats with a 12-point lead in the generic congressional ballot. That is well above what political scientists think they need to win back the House (7 points or so). The Kaiser Family Foundation showed Democrats leading Republicans 49 percent to 37 percent, up from an 8-point 46-38 lead in April. Quinnipiac had Democrats leading 51 percent to 39 percent over Republicans, up from a 9-point lead in late June. As Vox reported on Tuesday, with a little more than three months left until Election Day, Democrats seem to be strengthening their position to win control of the House.